When Greg Burel tells people he’s in charge of some secret government warehouses, he often gets asked if they’re like the one at the end of Raiders of the Lost Ark, where the Ark of the Covenant gets packed away in a crate and hidden forever. “Well, no, not really,” says Burel, director of a program called the Strategic National Stockpile at the Centers for Disease Control and Prevention. But some public health specialists worry about how all this would actually be deployed in an emergency. “The warehouse is fine in terms of the management of stuff in there. 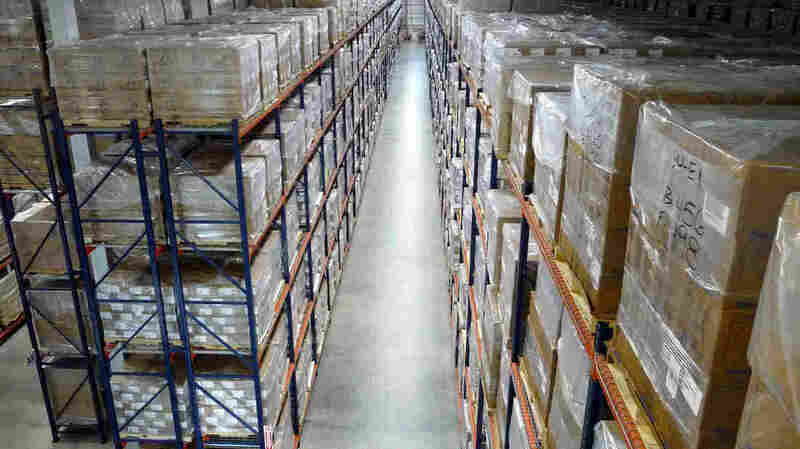 What gets in the warehouse and where does it go after the warehouse, and how fast does it go to people, is where we have questions,” says Dr. Irwin Redlener, director of the National Center for Disaster Preparedness at Columbia University. I recently asked to go take a look at one of the warehouses, and was surprised when the answer was yes. I was told I was the first reporter ever to visit a stockpile storage site. Since I had to sign a confidentiality agreement, I can’t describe the outside. But the inside is huge. “If you envision, say, a Super Walmart and stick two of those side by side and take out all the drop ceiling, that’s about the same kind of space that we would occupy in one of these storage locations,” Burel says. A big American flag hangs from the ceiling, and shelves packed with stuff stand so tall that looking up makes me dizzy. The Strategic National Stockpile got its start back in 1999, with a budget of about $50 million. Since then, even though the details aren’t public, it’s clear that it has amassed an incredible array of countermeasures against possible security threats. As we walk, I hear a loud hum. It’s a giant freezer packed with products that have to be kept cold. Just outside it, there are rows upon rows of ventilators that could keep sick or injured people breathing. Mabry explains that they’re kept in a constant state of readiness. “If you look down to the side you’ll see there’s electrical outlets so they can be charged once a month,” she says. Not only that—the ventilators get sent out for yearly maintenance. In fact, everything here has to be inventoried once a year, and expiration dates have to be checked. Just tending to this vast stash costs a bundle — the stockpile program’s budget is more than half a billion dollars a year. And figuring out what to buy and put in the stockpile is no easy task. The government first has to decide which threats are realistic and then decide what can be done to prepare. “That’s where we have a huge, complex bureaucracy trying to sort through that,” says Redlener. The process goes by the clunky acronym PHEMCE and involves agencies from the Department of Defense to the Food and Drug Administration. They’re looking to acquire or develop products that can meet the threats. There is often debate, he says, but at the end of the day they have to reach a consensus and move forward. “We could start stockpiling cobra antivenom if we really wanted to, but should we?” says Rocco Casagrande, who runs a consulting firm called Gryphon Scientific. The trouble is, increasingly the new medicines chosen for the stockpile have some real limitations. “These are often very powerful, very exciting and useful new medicines, but they are also very expensive and they expire after a couple years,” says Dr. Tara O’Toole, a former homeland security official who is now at In-Q-Tel, a nonprofit that helps bring technological innovation to the U. S. intelligence community. O’Toole chairs a recently formed committee at the National Academies of Sciences, Engineering and Medicine, which the government asked to study the stockpile program and offer advice. She says as the inventory of the stockpile goes up and up, the budget to maintain that inventory is staying flat. Back at the warehouse, Mabry and Burel show me all the ways they’re set up to expedite delivery. For example, one of the first things you see when you walk into the warehouse is rows of 130 shipping containers. “This is the 12-hour push package, approximately 50 tons of material,” says Mabry. The people who would receive this container — or anything else from the stockpile — are state and local public health workers. They’re the ones who have to figure out how get pills into mouths and shots into arms. But local public health officials have had budget cuts and are drastically underfunded, says Paul Petersen, director of emergency preparedness for Tennessee. Over and over, I heard worries about this part of the stockpile system. She’d also like to see more interest from Congress in all of this — because it’s a national security issue. “These will be do-or-die days for America, should they ever come upon us,” O’Toole points out. And having a stockpile in a warehouse will be just the beginning.